An exhibition containing a collection of fifty-four collages by architect and educator Bernhard Hoesli, completed between 1963 and 1984. Very intimate in scale, these works demonstrate a process of making and experimentation, of layering and three dimensionalization, wherein Hoesli revisited and reworked many of the pieces numerous times, some over a period of several years. As Hoesli once stated, “First of all we must be clear that by collage one understands, of course, a picture, a type of painting, an object. 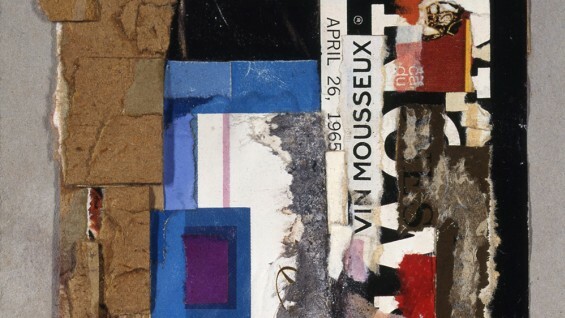 However, one can also say that this object is the result of a process, a particular kind of approach to shapes, colors and, typically, for collage, scrap paper. So a collage is not only meant as an object, something made, a result, but what is perhaps far more interesting: a process. Moreover, that behind this way of doing something which as a result then leads to a collage, the collage could be meant as an attitude of mind.” Although the collages can be read primarily through the aesthetics of design, these works clearly illustrate an ongoing exploration of the relationship between painting, architecture, and form, paralleling Hoesli’s development of the architectural curriculum at the ETH in Zurich, part of his greater forty-year involvement in architecture. Bernhard Hoesli was born in1923 in Zürich, Switzerland. He enrolled in architectural studies at the Swiss Federal Institute of Technology in Zürich in 1943, and received his diploma from the ETH five years later. Subsequently, he worked at the architectural practice of Le Corbusier in Paris and Marseilles, where among other projects, he assisted in the publication of Le Modulor. During this period he also spent time studying painting under Fernand Léger. In 1950 he left Le Corbusier’s practice and came to the United States. A year later, at the invitation of Harwell Harris, director of the School of Architecture at the University of Texas at Austin, he began his influential career in education as a professor at the School of Architecture at the University of Texas at Austin. There, Hoesli began an extremely important collaboration with colleagues John Hedjuk, Lee Hirsche, Lee Hodgden, Werner Seligmann, and John Shaw, and especially Colin Rowe and Robert Slutzky. Later to become known as ‘The Texas Rangers,’ these figures would revolutionize architectural education in the United States and Switzerland. In 1959, Hoesli returned to Zürich and began teaching at the ETH, there he directed the first year architecture design program – the Grundkurs – until 1981. The pedagogy he developed became part of the permanent structure at the ETH curriculum. In addition to running an architecture firm with colleague Werner Aebli in Zürich between 1960 and 1970, Hoesli served as Chairman of the Architecture Department of the ETH from 1968 until 1972, and as university’s Director of the Institute of History and Theory of Architecture (gta) from 1976 until 1980.